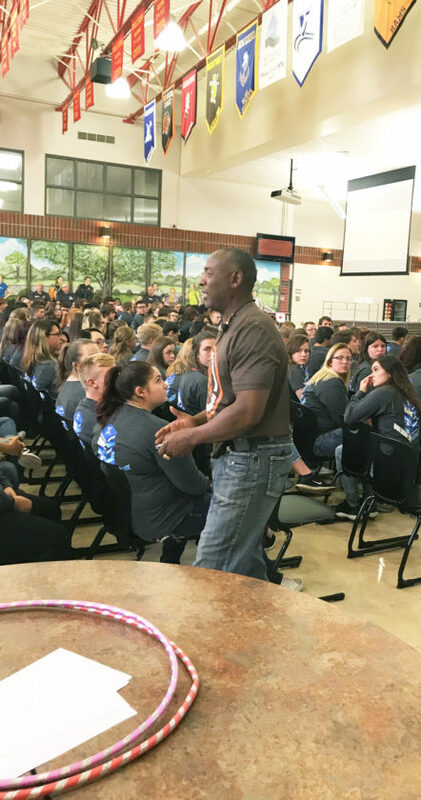 PHOTO BY ZACH BAKER Former NFL running back Earnest Byner talks to students Friday at Sentinel Career Center in Tiffin. Byner spoke about triumphing over adversity, and about his non-profit organization, the Healing Dawgs. Earnest Byner rarely stood in one place. He was moving constantly. Telling the hundreds of high school students seated in front of him about his life, his NFL career and the lessons he’d learned. If the former Cleveland Browns’ star saw someone in the audience at the Sentinel Vocational Center start to lose focus — that was a big theme in Byner’s presentation — he’d stop and engage them. Energetic and engaging, Byner was as he was as a player — involved. Ready at any moment to change things up to get a message across. The students at Sentinel weren’t even born when Byner took his last NFL snap for the Baltimore Ravens in 1997. If they knew of him or one of his his biggest — and toughest — moments on the field, it probably came from the memories of others. But still, Byner’s presence controlled the room. Byner admitted to the room that in one of the biggest moments in his career, he failed. But it didn’t make him a failure. For many, Byner is remembered for a fumble in the 1987 AFC Championship Game in Denver. With the Browns trailing the Broncos 38-31 in the final minutes, Byner coughed up the ball as he was about to go in for a tying touchdown. The Browns lost, 38-33. It remains the closest they have been to a Super Bowl appearance. It didn’t matter to some that Byner was the biggest reason the Browns were in a position to win. Trailing 28-10 in the third quarter, the back sparked the Browns with more than 120 yards receiving and 67 yards rushing. It upset me as a child (I was 6 years old when the fumble occurred) that Byner received so much flak nationally. It still upsets me today, but for a different reason. Byner was a guy who was a 10th-round draft pick in 1984. He became one of the Browns best players in short order, running for more than 1,000 yards in 1985. A hard worker who was beloved by coach Marty Schottenheimer, Byner was someone who knew how much what he was doing meant to fans, and appeared inspired by it. In Andy Billman’s 2016 film, “Believeland,” Byner faced the camera and apologized for fumbling, and told the fans how much he enjoyed playing for them. And that’s what upsets me. Why did such a moment have to happen to a man like Byner? He understood us, he understood what being a Brown meant. There are probably hundreds of players who — after the game they had before the fumble — would have shrugged it off, or fired back at their critics. But not Byner. Even today, it doesn’t seem fair for a man of such strong character to endure something like that. He and a fumble became linked, and are to this day. But Byner — who went on to win a Super Bowl with the Redskins in 1992 — doesn’t hide from that moment. He wrote a book, “Everybody Fumbles,” and on Friday candidly answered questions about the play, the aftermath, and how he overcame it. Byner said he wants people to know they also can overcome adversity. Before Byner spoke to students at Sentinel, he spoke to me for about seven minutes. Byner answered every question I had. About his career, his message, his work with his non-profit organization, The Healing Dawgs, and about the direction of his former team, the beloved and beleaguered Browns. But I had to tell him some things, too. How he was one of my favorite players. How the Cleveland Browns — during his career and now — unite my family for three hours every Sunday. But mostly, I had to ask him if he knew. If he knew how much those teams of the mid-to-late 80s meant to me and every Browns fan back then. Byner said his message — and The Healing Dawgs — is for many groups of people. From Twitter, it’s clear Byner still follows the Browns intensely. So I asked if he thinks the current team — perennial last-place finishers since its return in 1999, can finally turn it around. When we were finished, I gave Byner a hug. Sometimes, you just have to let yourself be a fan. It was always easy to be a fan of Byner the player. But now, it’s even easier to admire him as a person.